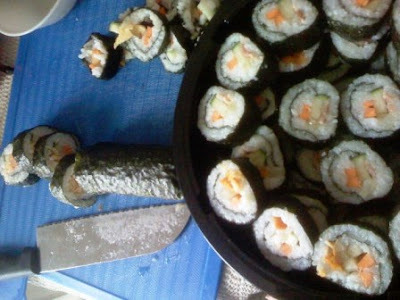 I totally enjoyed making maki at Glen's and Cory's place that we decided to make some for the New Year. 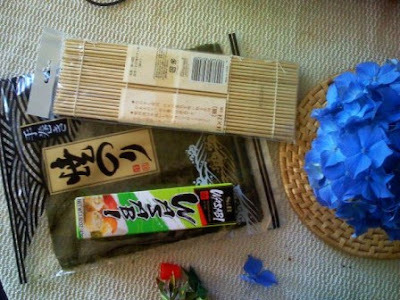 And to make it into a more engaging experience, we bought a sushi mat and a tube of wasabi as well. 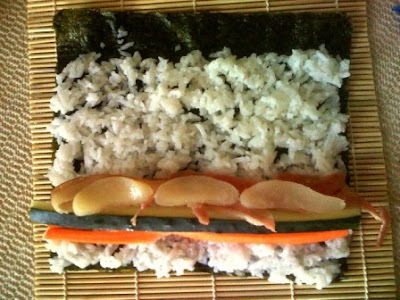 Plus, we decided to become a bit more adventurous with the fillings. We used canned pears to accompany the usual cucumber and carrots, followed by either scrambled eggs, smoked fish, or bacon. These "adventurous" fillings worked well. I bet other fillings will work too. I was actually considering spam also but we already had too much maki in our hands; we'll try that some other time. I have had some experience with wasabi-in-a-tube before, and we considered it a weaker version of the nostril-flaring, brain-freezing concoction (compared with the powder type). And it was roughly the same in this case. We had to mix a lot of the green stuff into the soy to give the desired kick. Hmmm... I guess we should have applied the wasabi directly into the maki. It was a cool food trip just the same. Dyosa: Madali lang at enjoy pa! Wow, i miss this food.